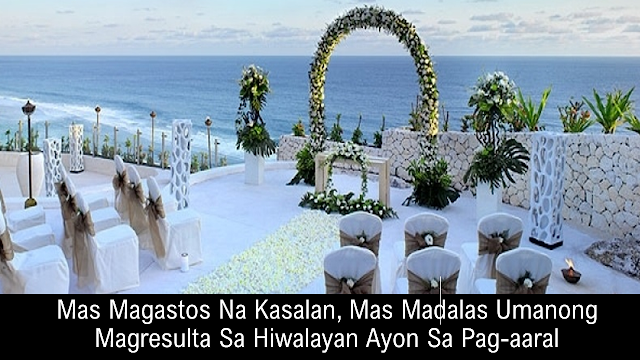 Does an extravagant wedding guarantee a bountiful and happy marriage? People spend an awful lot of money on their wedding, making sure that this once-in-a-lifetime event will be memorable. The irony of this is that, in a study, they have found out that a couple who spent a large amount of money on their wedding often end up in separation. Economics professors Andrew Francis-Tan and Hugo Mialon conducted a survey from 3,000 participants who are married people and the results have shown that there are several characteristics that increase the likelihood of failed marriage. There are many factors that the researchers looked into. One of these is the amount that the couples poured in for their engagement rings. “Specifically, in the sample of men, spending between $2,000 and $4,000 (Php 104,000 – 208,000) on an engagement ring is associated with 1.3 times greater hazard of divorce as compared to spending between $500 and $2,000 (Php 26,000 – 104,000),” the paper reads. Another factor that the researchers noticed is the costs of the wedding ceremony. Those whose weddings cost less than $1000 (Php 52,000) showed a significant decrease in the likelihood of separation. The results show a huge difference compared to those couples who spent around or more than $20,000 (Php 1,042,800) as the likelihood of separation increased by 1.6 times for women. On an interesting note, one of the few expenditures which lowered the risks of separation was going on a honeymoon. The researchers found that couples who went for a honeymoon are “significantly associated with a lower hazard” from thoughts of divorce. The studies conclude that instead of spending so much on rings and the ceremonies, it might be better to spend money and quality time between couples on a private, post-wedding getaway.